OKI X-Press on Demand 360 A3 Laser Printer and ink. Approximate dimensions 670 cm width x 590 cm depth x 500 cm height. Test colour print good. Condition is Used - was used daily until 12 months ago. Includes 7 new ink cartridges (3 black, 2 magenta, 1 cyan, 1 yellow). Printer stand included. Buyer collects. OKI MC851 DN MFP. A3 & A4 LED Network Ready Colour Multifunction Desktop Laser Printer. USB, Network & Parallel. USB, Parallel, & Ethernet Connection Duplex Unit Adf. Up to 22ppm Colour Print. Printer Copier Fax Scanner. Oki A4 Mono Multifunction Laser Printer 33ppm Mono 1200 x 1200 dpi Print 3 Years Warranty - 45858401 (Printers > Multifunction Printers). The MB472dnw puts advanced 4-in-1 functionality on the desktop of even the most cost conscious user. • When new features are available you can update the device via the OKI portal. A4 Colour Laser Printer 30ppm Mono 26ppm Colour 1200 x 600 dpi1 Year On-Site Warranty. Print speed (Colour A4) 26 Page Per Minute. Automatic Duplex Printing (2-sided). Print up to 47ppm (Mono). USB and Ethernet connections. We will always go out of our way to source the product you are looking for. This LD620D Direct (No ribbon required) Thermal Label Printer (serial number BR4B000283A1) is in full working order (This is basically the Oki version of the popular Zebra LP2844). The Windows printer driver can be easily downloaded from Oki's website. 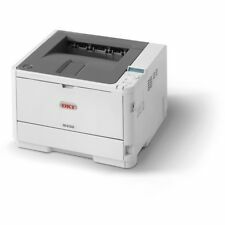 OKI MB472dnw mono MFP. 33ppm Mono Print. Printer Type Mono Only. Max Mono Print Speed 33. Printer Technology Laser. Printer Connectivity USB. Printer Connectivity Network. Printer Function Print. OKI C711 DESKTOP HD LASER LED COLOUR A4/LETTER PRINTER. TRANSFER BELT UNIT WILL NEED CHANGING SOON NEW FROM OKI £74.35. PRINTER IS 3 YEARS OLD. Max Resolution Colour 1200 x 600 dpi. Max Printing Speed Colour (ppm) 34 ppm. OKI B 721dn. Printer Type. Print Speed. Print server. 20000 pages. 200000 pages. Monthly Duty Cycle (max). Duty Cycle. The MC363dn is easy to set-up and use with a range of eco-friendly features that save energy and help to lower running costs, including duplex printing as standard. OKI MC363dn (A4) Colour LED Ethernet Multifunction Printer (Print/Copy/Scan/Fax) 1GB Backlit LCD 30ppm (Mono) 26ppm (Colour) 45,000 (MDC). 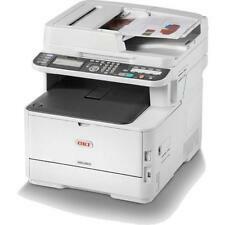 OKI MB492dn A4 Mono Multifunction LED Laser Printer. 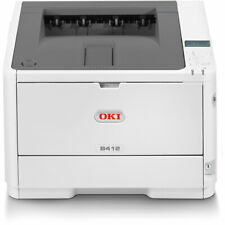 OKI MB492dn A4 Mono Multifunction LED Laser Printer 45858402. OKI MB492dn mono MFP. A4 Print speed: 40ppm. 40ppm Mono Print. Maximum Paper Size A4. Part : 01334101. Supplied with 12 month OKI Warranty. The Printer Broker Ltd is a supplier of printers, fusers and printer parts based in Bolton, Greater Manchester, UK. Oki C332dnw 46553102 Printers Laser Printers. Item model number: 46553102. High productivity - Combined printing, copying, scanning and fax functions. Simple to set-up, use and own - Duplex printing and eco-features save energy and budget.